Wow… last month of the year already! I would have liked to be able to say I read more books that I had planned this year but alas, time is just not on my side. Or, rather, reading time was not given the respect it deserved! I did, however, manage to read one book this month! The late, lovely Maeve Binchy’s last novel: A Week in Winter was, as expected, a joy to read. I shall so miss Maeve (though I haven’t read everything she’s written yet so I still have some to look forward to!) and cannot believe she is no longer around to entertain us with the lives of people in and around her beloved Ireland. I tried to take my time, to savour each moment, each chapter but as always happens, she draws you in to a world where you just feel like you could be one with the characters! At the end I was sorry to not hear about the rest of the lives of Chicky, Orla, Rigger, Winnie, John, The Walls, Henry & Nicola, Anders, Freda and even the grumpy, old Miss Nell Howe! Each of these people either worked in creating the inn known as Stone House, in the town of Stoneybridge, on the West side of Ireland; or were guests of the very first week it opened. I so wish I had a room there for a week! So, so, so enjoyable. Now, what to choose for this month? I mean, I’m still caught up in the goings on of Stoneybridge! Oh well… one must, eventually, let go and move on to something else. That something else is actually going to be two books. 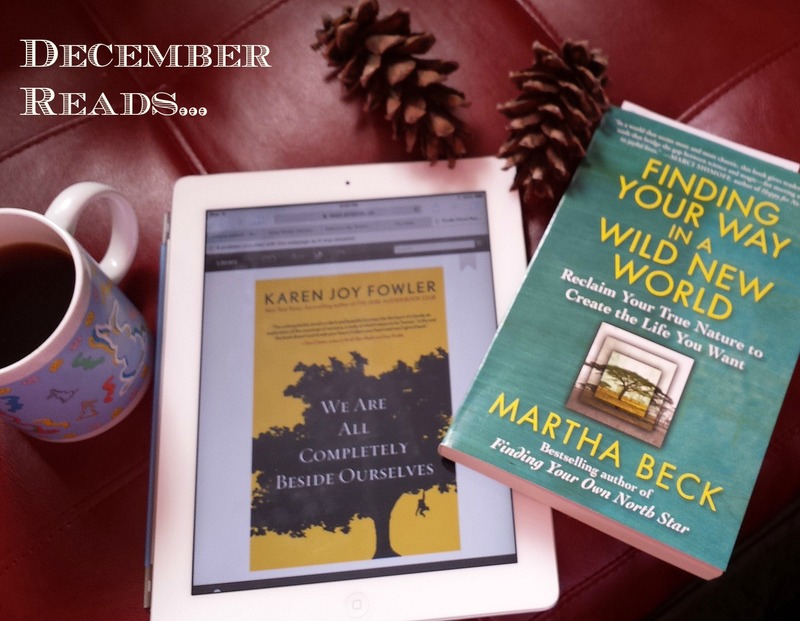 One recommended by my new friend Safia Moore, (a lovely blogger I follow, originally from Northern Ireland, now living in the UAE) “We Are All Completely Beside Ourselves” by Karen Joy Fowler. Other than what the front cover says, I am completely in the dark about this one! I like that. I am basing my choice solely on another’s recommendation. Will keep you posted! My second choice is “Finding your Way In a Wild New World” by Martha Beck. I have this habit of buying all sorts of self-empowerment books that just sit on shelves, collecting dust because “I’ll get to them eventually”. Well, eventually has arrived. I have decided to include one of these inspirational books per month as well as a novel. I have many of them and must justify the expense! I remember going to a seminar once and the animator said that he insisted on reading not only novels and not only books on personal growth or other “teaching-type” books but at least one of each (usually at the same time!) per month. Hmmm. So I’m trying that. I don’t usually have two books going at the same time… well not often anyway. Are you a “serial” reader or do you have an “open” relationship with books? This entry was posted in Books and tagged Karen Joy Fowler, Maeve Binchy, martha beck, the year in books, Top of the Tent. Bookmark the permalink. Hmmm, you piqued my interest with the book a week in winter. Have to look at it. Oh it was wonderful, Annet – but then again, I am a huge fan of anything Maeve Binchy… I may be biased! I definitely have an open relationship with books but have been known to get a little stalkerish about certain authors. Currently, I am reading tons of nonfiction, mostly adventure-y stuff, like Into Thin Air (I love Krakauer! ), Kon Tiki, Skeletons of the Zahara, and The Lost City of Z. I’m learning a lot about geography and history in a fun way. If I don’t “hear” from you, I wish you and CJ a most happy Holiday time! You too, Dale! I hope you and your family have super loads of fun…I am sure you will! We will most definitely try! I’ve been a serial reader since the very young age of 3 (yes, I started early, first with the “Ant & Bee” books by Angela Banner!). But I admit to having never read a Maeve Binchy novel, so that’s going to have to change, thanks to you, Dale. About three years ago, I discovered the delight of Rose Tremain’s novels after a friend of mine introduced her to me. It’s only in the last decade that I’ve stopped being a bit of a tomboy in my reading and started getting into women writers. I also adore anything Nordic, especially Peter Hoeg from Denmark. Just finished his wonderful but exceedingly strange novel “The Quiet Girl”. Hmmm… will definitely look into those titles you’ve mentioned! I like all sorts of novels! Try All The Light We Cannot See, by Doerr. You won’t be able to put it down. I just finished it. Now reading Dreamland (non-fiction.) I read more than I sleep. That might explain some things. Not a much of a book reader, but I’m currently in the midst of Bill Nye’s recent book. On the other hand, my wife is the prolific reader in this house. Off topic … thought of you today when I read about the passing of a Hab great. He was a heck of a player back in the day. Hey! At least you read! So sad to lose another of the great ones…no one lives forever. I’m such a serial reader, it’s getting ridiculous! I have a growing stack of books that I’m in the middle of reading–is this some bookworm form of ADHD? 🙂 By the way, I like your terms “self-empowerment books”, “personal growth books”, and “inspirational books.” Somehow, the term “self-help books” sounds so pathetic, but I do love the genre! Hmmm… I thought you were in more of an open relationship (reading more than one at the same time)!!! 😉 I would definitely call it Bookworm-ADD (I’m removing the hyper reference as it is difficult to be hyper whilst reading!) There was no way in hell I was using the term “self-help” – I put that term in the same category as the “for dummies” and “for idiots”. That said, I love the genre too… We can always learn, I say! Dale, lovely to see Maeve Binchy featuring so lovingly. She was arguably the most loved woman in Ireland. Jean, if I had all of her books at hand, I’d be reading one per month! I LOVE her! There’s a bit of both Dale! Depending on what’s around. Loved We are all Completely Beside Ourselves, such a beautiful read! Enjoy! Fun stuff! I am really enjoying the author’s voice… It is indeed a most enjoyable read! Am so happy it was suggested to me! I have never read any Maeve Binchy although I have heard of her….I hope you enjoy your reading choices for December! Oh she is a wonderful writer! I am very much enjoying so far! I usually have several books going at once, but that’s kind of like my life in general: lots of balls in the air. I love it with books because I can choose which one to read based on how I feel that day. Unless, of course, it’s a totally absorbing book then I read it cover to cover! And I, too, sometimes find it hard to move on from a book that really struck a chord. Good luck making the transition from Stoneybridge. I find that I’ve been doing that a bit more lately (more than one on the go) though once I get into one, I just can’t put it down! Oh… I am so far away from Stoneybridge with “We Are Completely…” one! Totally different voice! I am reading about four books at once right now:). Hopeless. I just finished Nora Ephron’s I Feel Bad About My Neck. So there’s an accomplishment. No longer in the middle of five books. Love Martha Beck’s column–let us know how you like the book! I hear you! We sometimes create crazy habits. I will definitely let you know!! Oooh… I wanted to read Nora Ephron’s book…is it good?